Here is an introduction to the richly diverse world of quality artisan beers. As most beer lovers know, the world of beer has grown far beyond the common pilsener-style beers brewed by the millions of barrels by conglomerate breweries. Today beers rival wine in complexity, variety, and sophistication. In ARTISAN BEER, Gary Monterosso explores this new beer landscape to enrich the beer experience for every drinker. The book surveys styles of beer, from ales and lagers to porters, lambics, and stouts, looks at pairing beer with food, and details a “dream team” case of 24 beers every beer lover must find and try. Also covered is how to hold a beer tasting, strategies for maximizing your enjoyment of beer festivals, how to select and store beers for aging, and much more. Any beer enthusiast will find Artisan Beer a rewarding read. 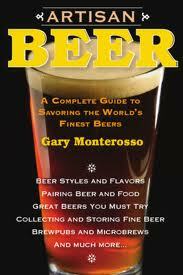 GARY MONTEROSSO is an award-winning beer writer and teaches beer appreciation at culinary festivals and events throughout the United States. He has appeared as a beer expert on the History Channel’s “The Epic History of Everyday Things,” and has been a regular beer commentator on the Sirius Satellite Radio Network. He is a two-time winner of awards from the North American Guild of Beer Writers. Web Re-design & SEO by IMM LLC.